Today political parties usually nominate their slate of electors at their state conventions or by a vote of the party’s central state committee, with party loyalists often being picked for the job. Members of the U.S. Congress, though, can’t be electors. Each state is allowed to choose as many electors as it has senators and representatives in Congress. The District of Columbia has 3 electors. During a presidential election year, on Election Day (the first Tuesday after the first Monday in November), the electors from the party that gets the most popular votes are elected in a winner-take-all-system, with the exception of Maine and Nebraska, which allocate electors proportionally. In order to win the presidency, a candidate needs a majority of 270 electoral votes out of a possible 538. On the first Monday after the second Wednesday in December of a presidential election year, each state’s electors meet, usually in their state capitol, and simultaneously cast their ballots nationwide. This is largely ceremonial: Because electors nearly always vote with their party, presidential elections are essentially decided on Election Day. 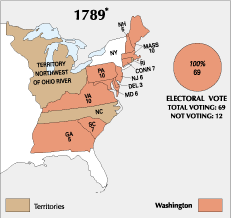 Although electors aren’t constitutionally mandated to vote for the winner of the popular vote in their state, it is demanded by tradition and required by law in 26 states and the District of Columbia (in some states, violating this rule is punishable by $1,000 fine). Historically, over 99 percent of all electors have cast their ballots in line with the voters. On January 6, as a formality, the electoral votes are counted before Congress and on January 20, the commander in chief is sworn into office. Critics of the Electoral College argue that the winner-take-all system makes it possible for a candidate to be elected president even if he gets fewer popular votes than his opponent. This happened in the elections of 1876, 1888 and 2000. However, supporters contend that if the Electoral College were done away with, heavily populated states such as California and Texas might decide every election and issues important to voters in smaller states would be ignored.